This set is called On The Fence and should be at your local Archiver’s soon, if not already, along with other retailers found here! There is Eyeliner Black Sparkly Fluff on the Bat and fun Lemon Drop Crafty Sparkles on the moon. The moon was created using a circle punch. 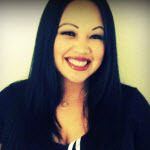 Now go check out the following blogs for more great sneak peeks! I absolutely LOVE everything Halloween. The sparkles on your card are fabulous! Shut up and Get out of TOWN! Ack! Joy, I LOVE what you’ve done with this fence!!! Too cute!!! Love it when you stamp! CUTE CUTE CUTE Mounds!! So CUTE Joy!!! Looks Like a FUN set…..Love what you did with it! Very cute card, love all the little stamps in the set. Just plain fun to look at. Well look at you, YAY, I’m happy to see you stampin’ my sweet! This is so CUTE Joy! Joy, this is cute as can be! Good luck with your release! Joy this is too darn cute!!! 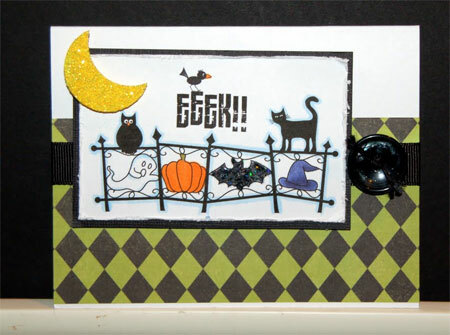 Cute card–Halloween is my favorite crafting Holiday. Great card! Simple but so fun as well! I love this card. I’m partial to Halloween. The fence is great. I love the green and black dp. Great card. This card is great! I really like that wrought iron fence image & you made it so colorful. Love this set. Scary enough for the big grandkids and sweet enough for the youngest! Totally adorable! Love the sparkly moon! What a fun Halloween card! I really like the way you put it together. This is a great stamp set. What a fun card. Love the coloring.